practice the application of accounting procedures with features like "Try It" and a new transaction analysis model, which clearly illustrates how transactions are the result of business decisions and recorded in a way to show their effects on the financial statements. Finally, students utilize section three, Business Applications. 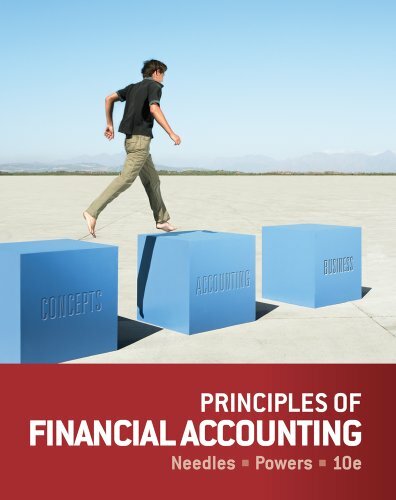 This section illustrates how the concepts and procedures are used to make business decisions. Real company examples are used throughout the chapter to show students the relevance of the material. This logical progression through the material is further supported in the online environment in CengageNOW with the Tri-Level Problem. This problem mirrors the Three Section Approach and connects the sections to facilitate a more complete understanding. These substantial changes will make students more efficient learners and prepare them to face a business world increasingly complicated by ethical issues, globalization, and technology. measurement, and corporate governance of high-performance companies in the United States, Europe, India, and Australia. Her research has been published in leading journals. Her textbooks, coauthored with Belverd E. Needles, Jr., are used throughout the world and have received many awards, including the Textbook Excellence Award and the McGuffey Award from the Text and Academic Authors Association. She has also coauthored three interactive multimedia software products. She currently serves on the Board of the CPA Endowment Fund of Illinois and is immediate past-chair of the Board of Governors of the Winnetka Community House. She is a member of International Association of Accounting Education and Research, and Illinois CPA Society. She has served on the Board of Directors of the Illinois CPA Society, the Educational Foundation of Women in Accounting, and both the national as well as Chicago chapters of ASWA.